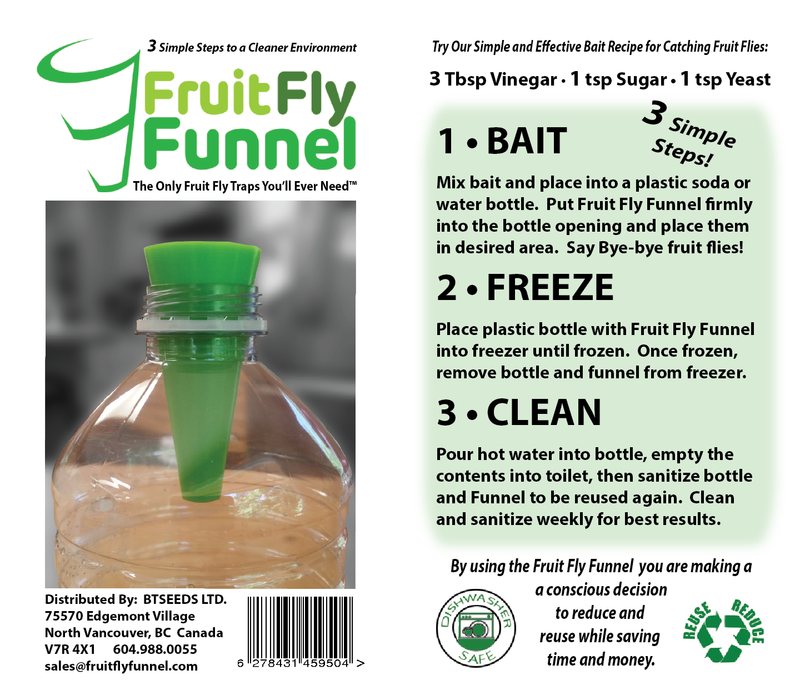 3 Simple Steps – FruitFlyFunnel™ – Say Bye-Bye Fruit Fly with the washable reusable trap for fruit flies that’s environmentally friendly! 3 Simple Steps to Your Cleaner Environment! Add fruit fly bait to your plastic bottle and insert the Fruit Fly Funnel into the opening. Please only use plastic bottles, as any breakable container adds unnecessary risk. We recommend finding out what bait recipe works best for you, however in our experience we’ve found that 3 simple, safe ingredients worked best. 3 Tbsp white Vinegar, 1 tsp cooking Yeast, 1 tsp white Sugar. Add them each to your plastic bottle, then swish them together to mix and finally add the Fruitfly Funnel to the opening. Place the FruitFlyFunnel solution where you would find the highest concentration of fruit flies, typically near garbage or recycling areas, or under the sink in a home kitchen. For commercial applications place near sinks, trash cans, food prep areas as well as recycling, dining rooms and/or behind a bar. When choosing a location, it is recommended to place the Fruit Fly Funnel solution in an area that is not high activity, avoiding fans & high airflow, ovens or high traffic areas as flies can be easily agitated and may not be attracted to the bottle as easily. Allow 24-48 hours for fruit flies to find their way to their destination. Place plastic bottle, captured fruit flies and Fruit Fly Funnel into the freezer until frozen approximately 1-2 hrs. It’ll all be over quickly. Rinse bottle with hot water, empty the contents into a toilet and flush, then sanitize your bottle and Fruit Fly Funnel to be reused again from Step 1. Does it get any simpler than a reusable, washable, sustainable fruit fly trap solution that actually works?